If you have sources of modules you want to reuse, click Add Project…​ button and browse for the suite or standalone module project you want to add. You can actually use older platform as long as you configure it to use newer harness (either via Tools → NetBeans Platforms in IDE or by specifying harness.dir) and you develop in new enough IDE. Now install the plugins you are interested in (using the Update center or manual install). 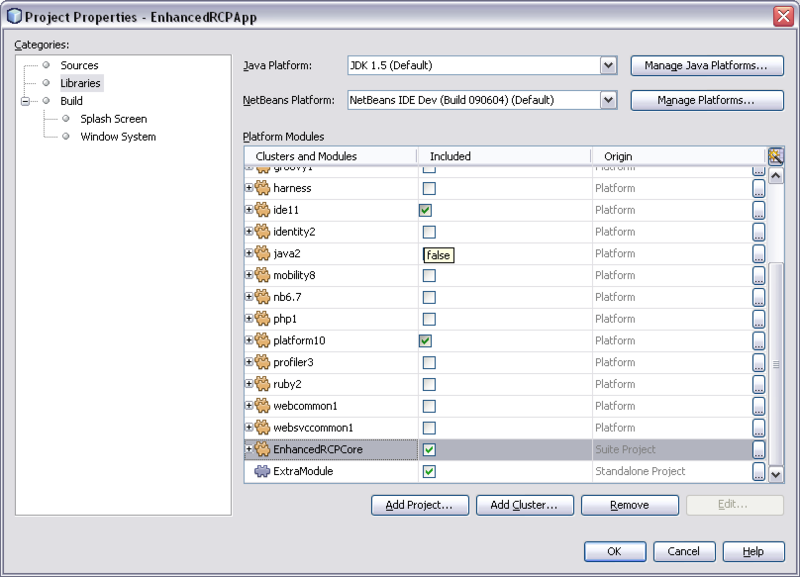 They’ll be installed in a different place within the NetBeans platform depending on the classification of the plugin. Verify in the platform, you might have a new cluster named extra. Note: Nothing magic about it. Just used the Netbeans task makeupdatedesc. Feel free to change the target name and change ./build with something smarter (I couldn’t find a pre-defined variable for that in the stand alone modules). Create an instance of org.netbeans.spi.autoupdate.AutoupdateClusterCreator as a service provider. Unless you have an appropriate AutoupdateClusterCreator service in your platform application, these properties have no effect and all updates will always be installed in the user dir! Unfortunately, this is poorly documented. The easy way to create one such AutoupdateClusterCreator was for me to adapt the source file of the default IDE implementation (http://hg.netbeans.org/main/file/tip/updatecenters/src/org/netbeans/modules/updatecenters/resources/NetBeansClusterCreator.java ) to my own needs. 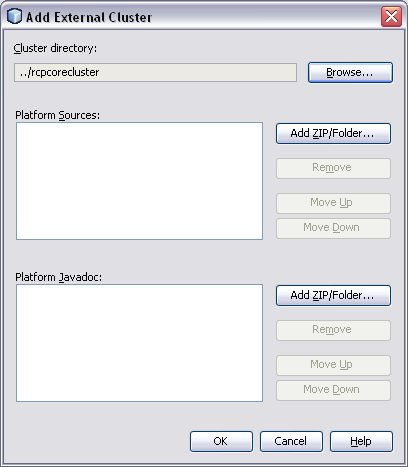 Basically, all you have to do is replace one file name: “netbeans.clusters” must become “yourbrandingappname.clusters”. You’ll find the respective file in “install-dir/etc” of your application. This page was exported from http://wiki.netbeans.org/DevFaqHowToReuseModules , that was last modified by NetBeans user Markiewb on 2017-01-04T22:22:30Z.